Peter Layne Arguimbau is an American painter, restorer and historian of classical art. Peter’s subject matter includes portraits, animals, and landscapes, but is notorious for his classical marines. Peter’s father, Vincent, was a portrait painter who started to develop his son’s skills at an early age. In 1958 a colleague of Vincent’s came to the Arguimbau’s home to concoct a 17th century paint formula known as the Maroger Medium, all under Peter’s watchful eye. The old masters used these gel mediums to glaze a spectrum of oily-resinous colors which led to the Golden Age of Art. Following this nascent realization Peter began a lifelong pursuit of the technique of Renaissance painting. Born in Darien, Connecticut in 1951, the family lived between Scotts Cove and Seville, Spain. After attending Loomis Chaffee and Vassar College, Peter went on to study under Frank Mason at the Art Students League of New York for 14 years. Peter then traveled abroad for a three year classical study of the Baroque Era in Florence, Rome and Naples, as well as Hellenistic Classicism in Athens, Olympia, and Delphi. He learned the techniques of the old masters by copying paintings from Museums throughout Europe and America. After a decade spent testing recipes from medieval manuscripts with restorer Pierro Mannoni, Peter continues to grind his colors from powdered pigments and cooks his mediums without relying on industries' rudimentary products. The focus of his life’s work has been applying his skill through his love of the sea which he views from S/Y Molly Rose, a 30 foot Catboat built in 1935. He lectures regularly on the technical evolution of painting since the Renaissance. Born and raised on the bayou, Laura Cooper began life surrounded by water. Her childhood home was on the banks of the Vermilion River in Lafayette, Louisiana. She has fond memories of waking up in the middle of the night to distant rumbles of tugboats pushing barges from offshore rigs in the Gulf of Mexico. This early exposure to the maritime world has led her to pursue capturing the essence of sailing on canvas. Her work combines a unique relationship between atmosphere and light while maintaining a painterly feel. After graduating from high school, Laura moved to Boston in to earn her degree in English from Northeastern University. After a brief stint co-writing a column about computers she decided to go back to school and earned her Bachelor of Science in Nursing from Simmons College. Her first job as a nurse was at Boston Children’s Hospital in Cardiology. She later worked at Boston City Hospital in Labor and Delivery. The whole time she was trying to establish herself, she was taking art classes. Working from life, plein air painting became a way to release stress. As time went on, it became apparent that all she wanted to do was paint. She began to take her art more seriously and sought out well-known Bostonian artists including Robert Cormier. Currently, she paints with marine artist, Richard Loud. Her many accomplishments include the Emerging Artist Award in 2015, the Yachting Award in 2016, and the Thomas Hoyne Award in 2017, at the International Marine Art Exhibition in Mystic Seaport. She is a Signature Member in the American Society of Marine Artists. Russ Kramer depicts large-scale studio paintings create 'first-hand' experiences for the viewer, putting you right on board during some of history's greatest yacht races or turn-of-the-century luxury vessels. A sense of the dramatic moment, combined with meticulous research and attention to detail, have found considerable appeal and sell quickly into private and corporate collections. His works are unique and immediately recognizable, combining narrative, historical, figurative and maritime disciplines. He is a Fellow and serves as the current President of the American Society of Marine Artists. He has won awards at the Mystic International Marine Art Exhibition, including the Yachting Award in 2009, 2010, 2011 and 2013. Russ lives and works in Mystic, CT.
Richard K. Loud was born on the Adams Shore section of Quincy Bay in Massachusetts. The son of a master shipwright, he was exposed early on to the complexities and beauty of boat design. This early training and passion for sailing is evident in his paintings today. His work combines a thorough understanding of a wide variety of vessel types and sea conditions, with a unique artistic feeling of light and atmosphere. After working his way through Northeastern University as a draftsman for the Penn Central Railroad, he served as a deckhand on a 114-foot motor yacht and later assisted his father designing and building yachts. During this time, he strived to paint the scenes that surrounded him. ‘…the real guts of Richard Loud’s work lies in an intuitive understanding of how ships relate to their element, how the wind hums in their rigging and the water dances around their hulls’. Testimony by John Stobart. David Monteiro is a native of Plymouth, Massachusetts and studied at Massachusetts College of Art where he graduated with a Bachelors Degree of Fine Arts. Shortly after graduating, David began a successful career as proprietor of Monteiro Design, a graphic design studio. Aside from his artistic talent as a graphic artist, he excelled in technical and "free hand" illustrations. Though David spends many hours in the studio producing what is commonly called "studio paintings", he is constantly drawn to paint on location regardless of weather conditions. David travels the New England seacoast throughout the year to capture the beauty nature has to offer. As an avid sailor he has always been intrigued by classic sailing vessels, which he often incorporates into his paintings. David was awarded the "Rudolph J. Schaefer, III Emerging Artist Award" at Mystic Seaport. He was also honored with the Joseph Gazzola Award for Excellence in Art during his first year as member of the Copley Society of art, Boston, MA. He was selected to the "Between the Shining Seas" exhibit at the Wisconsin Maritime Museum and the Minnesota Marine Art Museum. David has been featured in several issues of "American Art Collector". He is a member of the American Society of Marine Artists. Patrick O’Brien is an award-winning artist whose striking paintings depict the classic age of fighting sail. An illustrator and painter since the 1980‘s, O’Brien entered the marine art field in 2003. O’Brien has twice won an Award of Excellence at the prestigious Mystic International Marine Art Exhibition. In 2010 he won Mystic’s Museum Purchase Award, with The Mystic Seaport Museum in Connecticut buying his painting for its permanent collection. In 2012, The National Maritime Historical Society awarded O’Brien with their Distinguished Service Award for his body of artwork. O’Brien has had one-man-shows of his work in New York City, Annapolis, MD and Portsmouth VA. In 2010 the U.S. Naval Academy Museum mounted a retrospective exhibition entitled “The Maritime Art of Patrick O’Brien,” featuring twenty-eight paintings by the artist. O’Brien’s paintings have been featured several times on the cover of Naval History magazine, published by the U.S. Naval Institute, and several times on the cover of Sea History magazine, published by the National Maritime Historical Society. His paintings have been used on numerous book covers, and shown in The New York Times. Mr. O’Brien lives in Baltimore, Maryland with his wife and son. Sergio Roffo has been inspired by the work of American traditional painters such as Inness, Fitz Henry Lane & Albert Bierstadt, among others. Roffo's representations of coastal landscapes reveal a luminous, masterful feeling. As you view his art, you will discover a precise sense of value and atmospheric perspective that conveys a relaxed sense of calmness; a characteristic that defines and informs all of his works. Sergio Roffo's captivating depictions of the New England landscape have been included in a variety of museum exhibitions. 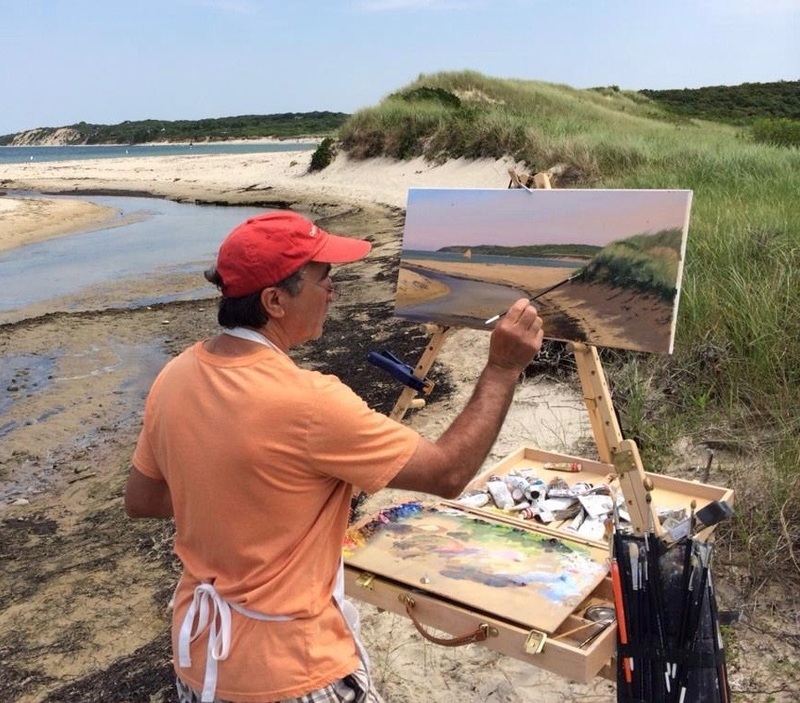 Mr. Roffo’s coastal landscapes are inspired from painting in “Pleinair”, on location. Sergio’s work is widely collected and has received many awards. He holds the honor of being one of the youngest artists to be designated a “Copley Master” by the Copley Society of Boston. An elected “Fellows” member of the American Society of Marine Artists, an elected member of the Guild of Boston Artists and an elected “Living Master” by the Art Renewal Center, ( ARC ). Sergio's work is included in many private and publicly owned collections and is an elected member of the Salmagundi Club in NYC. The youngest of six children, Sergio was born in San Donato Italy. His family immigrated to Boston where sometime after high school he attended Vesper George School of Art in Boston, majoring in Fine Arts and Illustration. After graduation Mr. Roffo freelanced as an Illustrator for some time and became very successful after acquiring and agent in NYC. The demands of Illustration and burning the midnight oil took it's toll on Sergio and eventually turned to Fine art, studying under the Boston School painters, Robert Douglas Hunter and Robert Cormier where Mr. Roffo honed in on his traditional drawing and landscape techniques. Paul operates a custom woodcarving studio located in East Sandwich, MA. For over half a century Paul has built a reputation for quality and craftsmanship. His eagles are hand-carved from a variety of lumber and meticulously hand-finished with 23 karat gold and paint. He began carving 2-dimension eagles but has enjoyed the complexity added through round and contemporary styles. Designs are based on or inspired by the traditional eagles that have adorned residential and commercial buildings for centuries in America. Paul’s unmatched craftsmanship of the eagles has influenced apprentices and wood shops across the country.